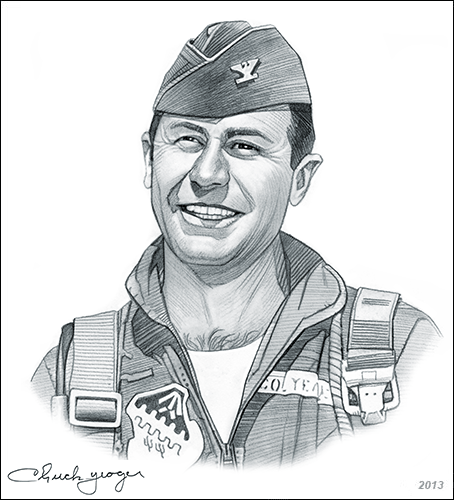 US Air Force Pilot Chuck Yeager was a fighter pilot during the World War II. In 1947, he became the first pilot to break the sound barrier in level flight. Later in life, he was able to break the sound barrier for the last time in a F-15D Eagle at the higher speed of Mach 1.45 in 2002 at the age of 79. He received numerous awards as a result of his achievements and was assigned to many different military posts between 1954 and 1962. Now, he is enjoying his retirement at the age of 91 in Penn Valley, California. Place of Birth: Myra, West Virginia, U.S.
Yeager, born to farming parents graduated high school in Hamlin, West Virginia. He joined the Citizens Military Training Camp at the Fort Benjamin Harrison, Indiana in 1939. In June 1961, he graduated from the Air War College at Maxwell Air Force Base. Charles Elwood "Chuck" Yeager was born on February 13, 1923 to the farmers Susie Mae and Albert Hal Yeager in Myra, West Virginia. He had 4 siblings namely, Roy, Hal Jr., Doris Ann and Pansy Lee. On February 26, 1945, Yeager married Glennis Dickhouse and they had 4 children, Susan, Don, Mickey and Sharon. In 1990, Glennis died due to ovarian cancer. 10 year later, he met actress Victoria D’Angelo while hiking on a trail in Nevada County. On August 2003, they married and are currently living in Penn Valley, California. He started as an aircraft mechanic at George Air Force Base. He wanted to be enlisted for flight training but due to his age and educational background he was declined. When the World War II started, he was finally accepted by the force. This started all his great career as an air force fighter and test pilot. After the war, Yeager was assigned as A test pilot and was tasked to be the first to break the sound barrier. Luckily, he successfully broke the sound barrier flying the X-1 experimental rocket powered aircraft flying at a speed of Mach 1.07 and altitude of 45,000 feet on October 14th, 1947. On March 1, 1975, Yeager whilst serving at Norton Air Force Base finally retired from the Air Force . But he did not fall out of the limelight as he was strongly connected with General Motors. He was even appointed by President Reagan to join the investigation regarding the explosion of the Space Shuttle Challenger in 1986. On the 65th anniversary of his breaking the sound barrier flight, he created a new record at the age of 89 by flying a F-15D Eagle to Mach 1.45 at an unprecedented age. 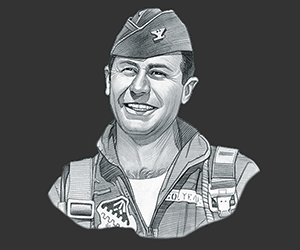 As the most accomplished test pilot and aviator, Chuck Yeager is a permanent fixture in history. No one could ever forget how he breaks the sound barrier twice with the highest speed possible. Even at a late age, he was still setting new records. He sure is a truly legendary pilot. "You don't concentrate on risks. You concentrate on results. No risk is too great to prevent the necessary job from getting done." you don't believe anything anybody tells you about an airplane." "If you want to grow old as a pilot, you've got to know when to push it, and when to back off. "There's no such thing as a natural-born pilot." "I was always afraid of dying. Always! It was my fear that made me learn everything I could about my airplane and my emergency equipment, and kept me flying respectful of my machine and always alert in the cockpit." but in our knowledge and experience of supersonic flight." This picture of Chuck Yeager is Copyright © June 2014 Siteseen Ltd. We only allow this picture to be used for printed non-commercial purposes and particularly encourage it's use for printed educational non-commercial purposes. This Chuck Yeager picture is not in the Public Domain. 3) Use of this Chuck Yeager picture, or any of our pictures on websites re-distributing copyright free material is strictly prohibited.